We’re grown ups now, let’s get some grown up furniture. 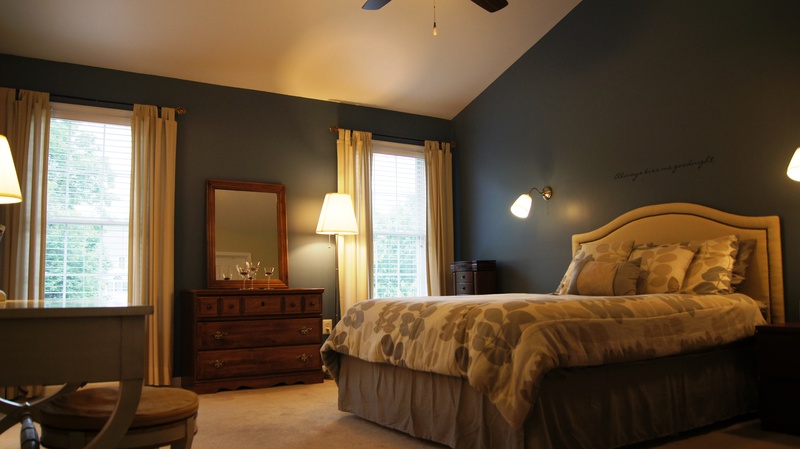 In our first two homes, the master bedroom was always close to the last room done on the list. It was always because no one sees our room when they came to the house, so it always just fell on the back burner. (This is also my reason for never making the bed! I really don’t care how they say that your day starts off so much better if you make your bed. Ain’t nobody got time for that.) Unfortunately, it was the room that we spend the most time in, other than the kitchen, so we really should have made it a priority. So when we moved into our Delaware home, I didn’t want to ignore it. We have always wanted a king size bed, and decided to finally take the leap. We started off with the queen sized bed that we’ve been moving around with us everywhere since it was David’s first big purchase for his apartment in New Jersey after he graduated college. We moved it to the Maryland house after we bought it, and then I made a DIY headboard for it (maybe I’ll do a post about that one day) to make it look less like a floating mattress pushed up against the wall. With some hand me down dressers from my parents, and some IKEA night stands, we made it work in both the Maryland house and the South Carolina house. When we settled in in Delaware, the room looked like this! 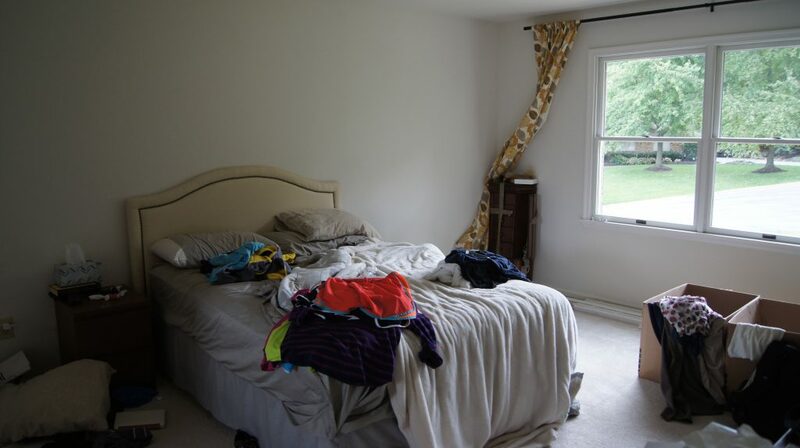 Ugh, now is that a good “before” picture, or what?? That queen sized bed wasn’t cutting it anymore. We stopped letting the dogs sleep with us awhile ago, because for being so friggin small, they sure do take up a lot of room. And then I would shift in the middle of the night and FEEL BAD about moving them and waking them up. Sigh. But, I was also getting more pregnant by the day back then, and my amazing SNOOGLE pillow took up some serious space. Seriously, if you are pregnant and considering a pregnancy pillow, I HIGHLY recommend that thing. 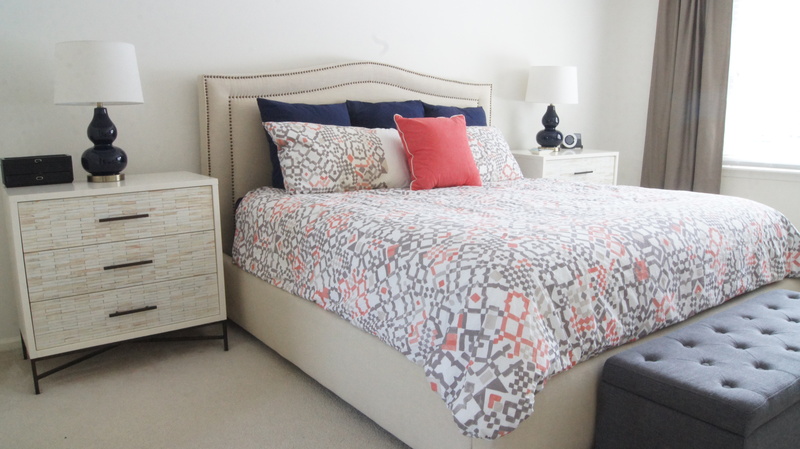 The headboard I DIY’d was an attempt to copy the pretty upholstered beds that I love so much. 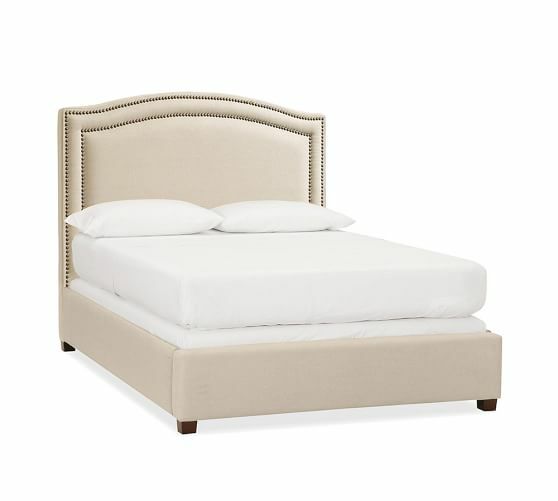 My goal for our new king size bed was a tall headboard with some curve to it, nail head trim, and an upholstered frame to cover the box spring. After some searching, I found the perfect fit at Pottery Barn with their Tamsen Curved Upholstered Bed and Headboard. Of course, I waited for it to go on sale, and then also used a 15% off coupon I found. 😉 It was the perfect fit for the room. We decided to go the duvet route this time, mainly because they are easier to clean than comforters. Also, because we wanted to get 2 duvets, one for the summer, and one for the winter. 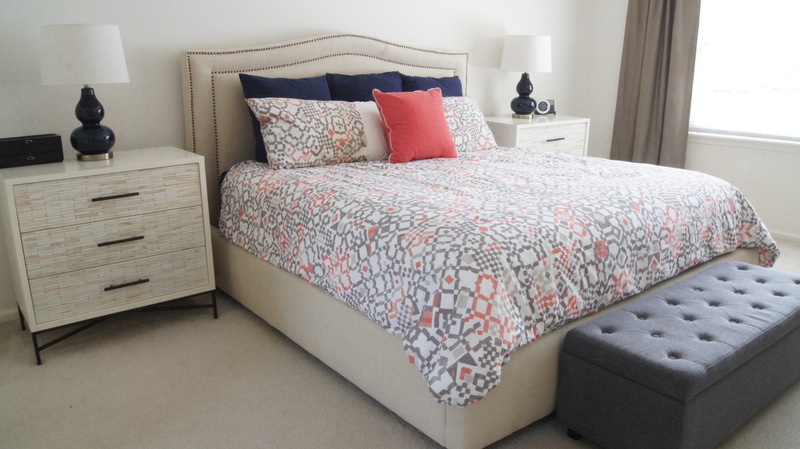 We’re a big fan of the IKEA duvets, because they’re comfy, and also not crazy expensive. Also, as you may have learned from our sofa hunt, I’m allergic to down, so I like the options. 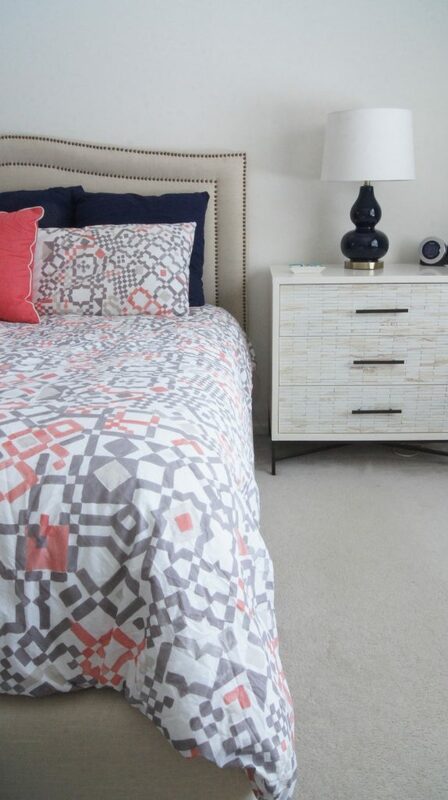 I’ve had great luck finding some beautiful, organic, duvet covers on the West Elm site on clearance, so I kept an eye out and found one on closeout! 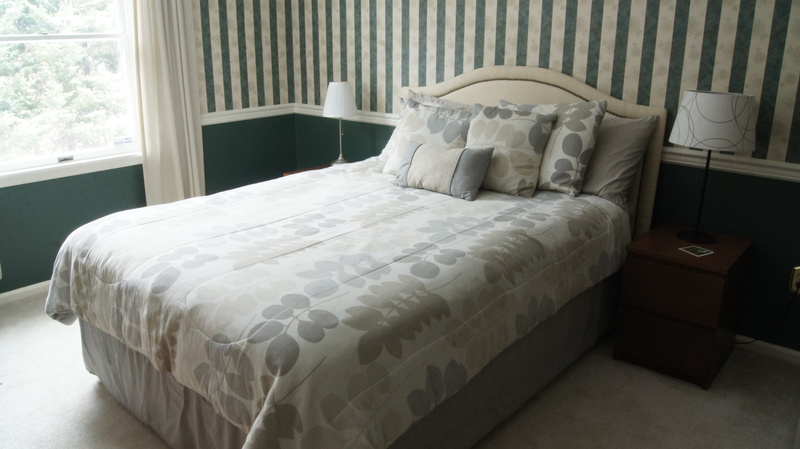 I paired it with some navy blue (my color<3) sheets and called it a day. 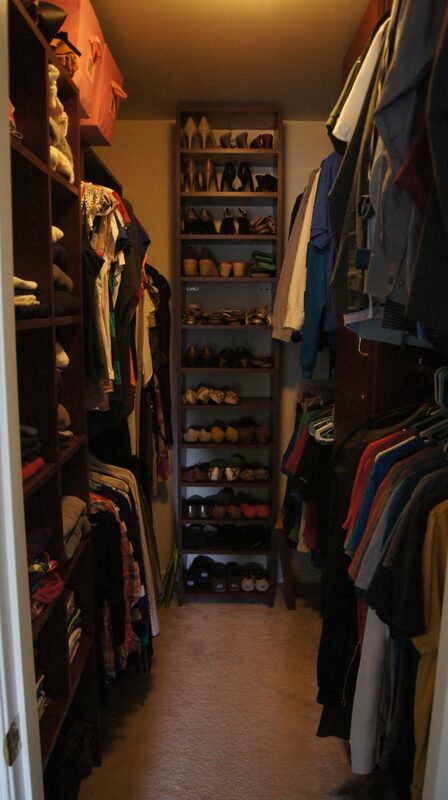 So in this house, our master closet isn’t HUGE, but it has the most amazing closet system in it that really maximizes the space and allows us to put most (if not all) of our clothing, accessories, shoes, and bags in it. So we really wanted to simplify the bedroom since we didn’t need much storage outside of the closet. We decided to do two dressers for our nightstands, and then call it a day. The Pottery Barn bed sits up pretty high thanks to the base and the height of the mattress that we bought, so we didn’t have any concern about a dresser being too high to be a nightstand. 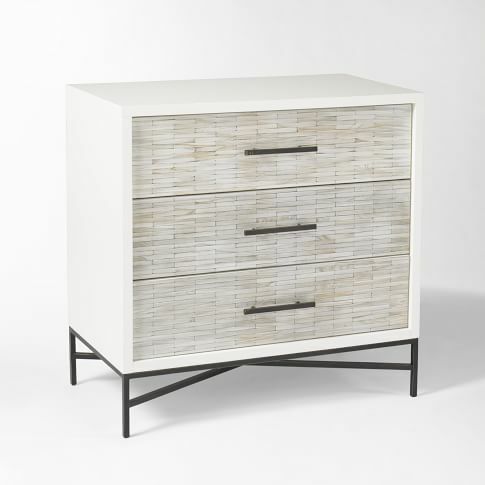 Of course, I had been eyeing up these wood tiled dressers from West Elm for years, and now was my time to buy them! I loved the simplicity of them, but also the detail of the drawers. They provided up the perfect amount of storage, not too little, and not too much. So they got delivered, (this was almost 2 years ago at this point, goodness, I can’t believe we’ve lived here this long already! ), and we finally felt like grownups. We treated ourselves to some nice grownup furniture that will hopefully last a lifetime (or until my style drastically changes). It was a step in the right direction of not leaving our room on the back burner. 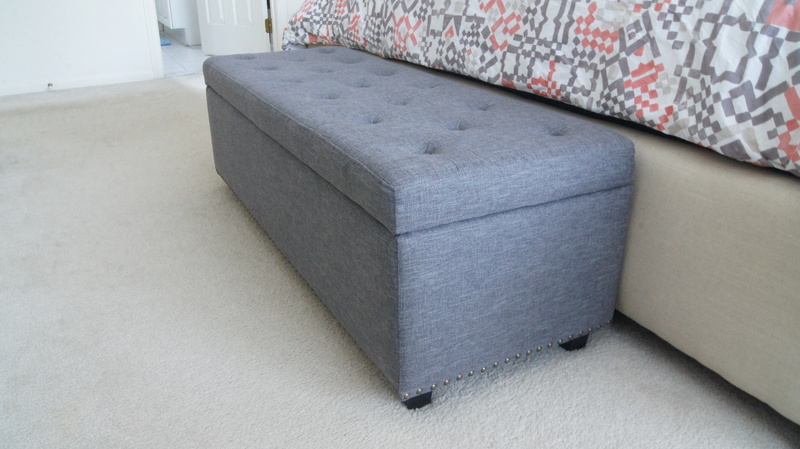 About a year ago, I came across a deal on Amazon for this grey upholstered storage bench at the end of the bed. 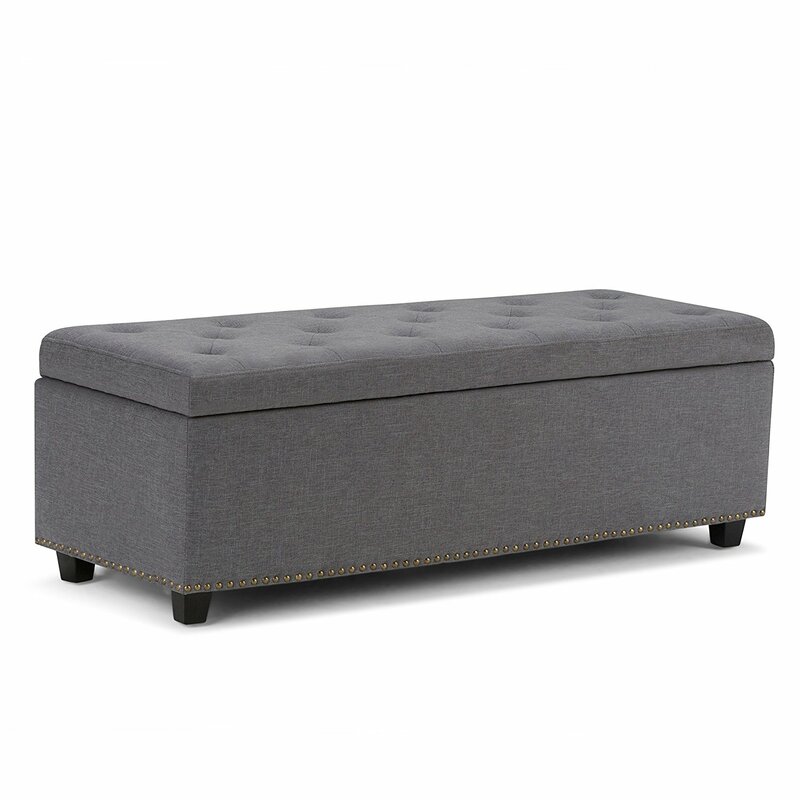 I’ve always wanted to get one for putting shoes on and storing the extra decorative pillows on our bed. It was a Lightning Deal for like 60 bucks and I did a 1 click order haha. I figured you couldn’t beat it. It was the perfect addition. Since then, we’ve done literally NOTHING else to this room. It still has the original beige carpets and beige walls from when we moved in. Maybe we’ll get on this soon? We’re really itching to finish laying the hardwoods upstairs, but then that means I’ll have to pick a paint color and find an area rug which already stresses me out :D. And doing flooring with a toddler around is just a nightmare. By the way, the old furniture ended up in our guest room downstairs. We used to have a full bed for our guest bedroom, but I’m sure our guests appreciate a little more room now. And that room is still on our list too, as it’s still sporting that lovely wallpaper. How about you? 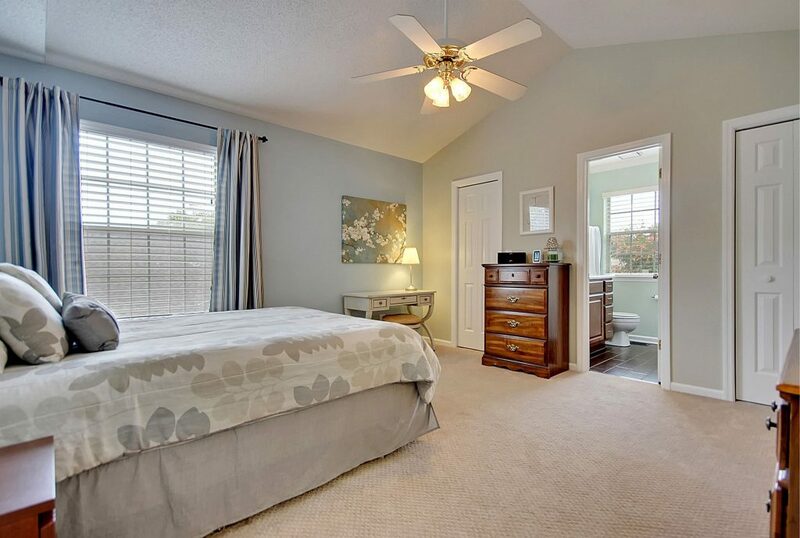 Is your master bedroom always put on the back burner? I’m determined to put more effort into it, even though we now have our “grown up” furniture. 1 Year and a New Year! Mirrors, mirrors, on the wall.